Listen to the big bang – now in hi-fi! This all-sky map from the Planck probe charts the imprint of the big bang's cosmic afterglow. The Planck cosmology probe has forced scientists to revise their estimates of the universe's age and the cosmic balance of matter and dark energy — and now it's led a physicist to remix the sound of the big bang as well. The new big-bang sound was created over the weekend by John Cramer, a professor emeritus of physics at the University of Washington. The audio file follows up on Cramer's decade-old audio rendition of the big bang, which was based on data from NASA's Wilkinson Microwave Anisotropy Probe, or WMAP. Planck and WMAP both charted subtle variations in the all-sky cosmic microwave background, a super-faint glow of stretched-out radiation from a time when the universe was 380,000 years old. The variations amount to mere millionths of a degree in temperature, but they record the imprint of fluctuations left behind by the big bang. Cramer released his original WMAP big-bang sound 10 years ago, but the Planck readings were so much better that a remix was in order. "The new frequency spectrum goes to much higher frequencies than did the WMAP analysis, and therefore offers a more 'high-fidelity' rendition of the Sound of the Big Bang," Cramer explained on a Web page providing the updated sound files. We're featuring the 20-second version, but you can download versions that play out for as long as 500 seconds. "I recommend the 100-second version, but you can choose for yourself," Cramer said. The sound follows the curves in Planck data to reflect the propagation of pressure waves through the medium of the early universe during the first 760,000 years of its evolution. The time scale has been speeded up astronomically, of course, and Cramer figures that the frequency has been scaled up by a factor of 100 septillion (that's a 1 followed by 26 zeroes). "The actual Big Bang frequencies, which had wavelengths on the order of a fraction of the size of the universe, were far too low to be heard by humans (even had any been around)," Cramer explained. Ten years ago, Cramer said that when he played the sound of the WMAP data on his computer, his dogs pricked up their ears and listened attentively. "There was less reaction from the dogs this time, but there was some barking when the big bang sound initially came on," Cramer told NBC News in an email. Sharp-eared listeners with a good sound system will notice that the Planck remix doesn't rattle the speakers as much as the WMAP original does. "The big bang sound is different because of the higher frequency components from Planck, and because I decided to shift the frequency scale factor to make less bass (since not everyone has a sub-woofer on their PC)," Cramer said. In addition to the big-bang sound, Cramer has several unorthodox claims to scientific fame, including his long-running column for Analog magazine; his science-fiction novels, "Twistor" and "Einstein's Bridge"; and his experiment to find out whether quantum mechanics would allow for backward causality. Cramer said his retrocausality experiment is currently in limbo. He has always said that there might be some subtle quantum effect that would rule out backward causality, and so far that's been the case. "The Mark II version of the retrocausality experiment has concluded for now, defeated by detector noise," he said in his email. "I'm currently in the process of writing a new pre-proposal (to a government organization I won't name) seeking funding for a Mark III version of the experiment. It would use noise-free superconducting-transition single photon detectors instead of the too-noisy avalanche photodiodes, would be down-scaled in wavelength a bit so that the entangled photon pairs would be at wavelengths matching the communication industry standard wavelengths for fiber optics, and would use two switched single-mode fiber optic Mach-Zehnder interferometers instead of lenses, prisms and mirrors on an optics table. Said organization is interested because there is the possibility of zero-time-delay communication with distant space missions." Read that last sentence again: Someone in the government is interested in zero-time-delay communication with distant space missions. Albert Einstein's theories suggest that information can't be transmitted any faster than the speed of light, but Einstein himself said quantum mechanics might open the door for "spooky action at a distance." Zero-time-delay communication certainly sounds spooky — but is it possible? Stay tuned. 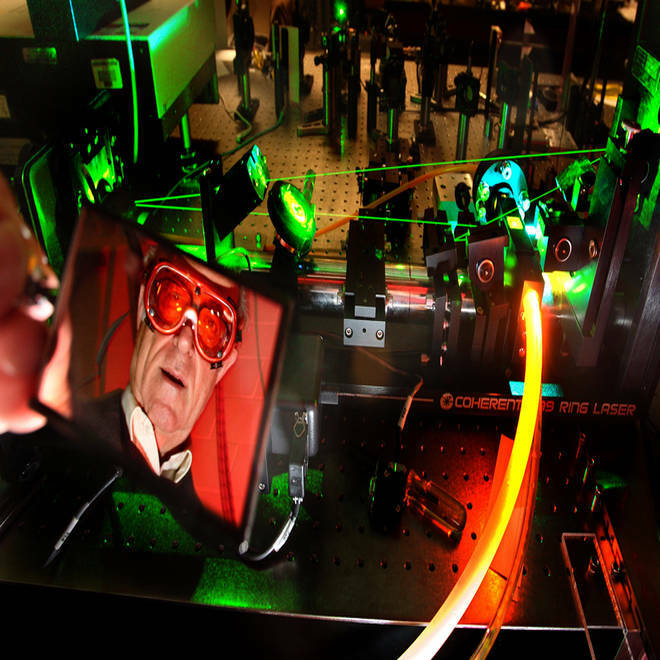 University of Washington physicist John Cramer, seen here in a 2007 photo, has been working on a laser experiment to test whether causality can work backward in time. Audio clips: Copyright 2013 John G. Cramer.